Jonas Tåhlin is CEO of Absolut Elyx and has been the Vice President Global Marketing at The Absolut Company since August 2011. As CEO of Absolut Elyx, Jonas is now based in New York as of Summer 2014 and in charge of the Global Brand Management and Innovation for ABSOLUT VODKA, MALIBU, KAHLÙA. I WAS RECRUITED INTO THE INDUSTRY BACK IN 2006 WHEN I WAS WORKING FOR PROCTER & GAMBLE IN LATIN AMERICA. I WAS OFFERED A POSITION AS HEAD OF EUROPE FOR ABSOLUT AND THAT WAS TOO EXCITING TO TURN DOWN. Tell us about Absolut Elyx. What inspired the idea and what is your vision for the company? THE INSPIRATION FOR ELYX WAS TO CREATE THE WORLD'S FIRST TRUE LUXURY VODKA. A VODKA OF INTEGRITY. THE WHEAT USED TO CREATE ELYX COMES FROM A SINGLE ESTATE IN A TOWN AHUS AND IS DISTILLED BY HAND IN A VINTAGE COPPER STILL FROM 1921. SMOOTH AS LIQUID SILK, THE VISION IS TO CREATE A VODKA BRAND KNOWN FOR INTEGRITY, CREATIVITY AND PREMIUM QUALITY. As VP Global Marketing of Absolut, what strategic partnerships did you implement which contributed to Absolut's success? THE DNA OF ABSOLUT IS IN THE ARTS, WORKING WITH MORE THAN 800 ARTISTS SINCE STARTING WITH ANDY WARHOL IN 1985. OUR PARTNERSHIP WITH ART BASEL ENABLES US TO CONTINUE THAT LEGACY. ONE PROJECT PARTNERSHIP THAT I WAS EXTREMELY PROUD OF WAS THE COLLABORATION WITH ELECTTRONIC DANCE MUSIC (EDM) BAND, SWEDISH HOUSE MAFIA. THEY CREATED A SONG FOR ABSOLUT CALLED "GREYHOUND" AND WE PROVIDED THE VIDEO. THE RESULT - ABSOLUT GREYHOUND - IS THE MOST WATCHED SPIRITS COMMERCIAL OF ALL TIME. What industry trends are you noticing and how do you capitalize on them? Discuss social media/marketing initiatives. EVERYONE KNOWS ABOUT THE SOCIAL MEDIA REVOLUTION WE ARE LIVING IN SO I WON'T DWELL ON THAT. WHAT I WILL SAY IS THAT AS BRANDS, WE NEED TO MOVE FROM SAYING TO DOING AND FROM MONOLOGUE TO DIALOGUE. ALL THAT IS ENABLED BY SOCIAL MEDIA, WHICH IS A NEW AND EXCITING TOOL TO DO WHAT MARKETERS HAVE ALWAYS HAD TO DO - MAKE PEOPLE FALL IN LOVE WITH OUR BRANDS. Describe the ideal situation to drink Absolut Elyx. WHEN YOU ARE IN AN ENVIRONMENT THAT LETS YOU TRULY ENJOY SOMETHING EXCEPTIONAL. WHERE YOU CAN JUST SIT BACK AND ENJOY. IDEALLY JUST OVER ICE OR IN A MARTINI. IT'S THE ONLY VODKA THAT HAS TASTE - PERFECT FOR SIPPING. Your greatest successes as marketing head of Absolut? Great challenges - how did you overcome and what did you learn? CHANGING THE ABSOLUT BUSINESS MODEL FROM BROADCAST TO ENGAGEMENT IN 2013! ABSOLUT WAS BUILT ON A BROADCAST MEDIA APPROACH WITH HEAVY PRINT SPENDING. IN AN INCREASINGLY CLUTTERED MEDIA LANDSCAPE WE CHANGED THE BUSINESS MODEL FROM BROADCAST MEDIA TO EXPERIENTIAL MARKETING, ENGAGING WITH MILLENNIALS TO SHAPE A BETTER FUTURE WITH A CALL TO ACTION OF "TRANSFORM TODAY" - OUR NEW GLOBAL PLATFORM. LIVE AND LOVE THE WORLD WHERE ARE BRANDS ARE CONSUMED. IF YOU LOVE THE WORLD YOU WILL DO WELL. BUSINESS: MICHEL ROUX – THE MAN WHO BUILD ABSOLUT VODKA IN THE 1908’S IN THE SAME WAY THAT I AM BUILDING ELYX! PERSONAL: MY WIFE. SHE IS A GODDESS. 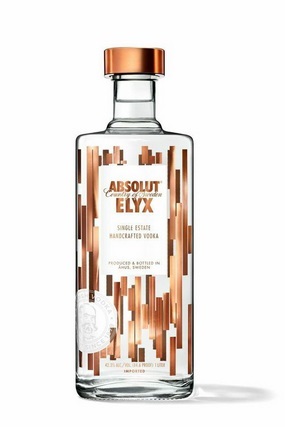 What's next for Absolut Elyx? FOR ELYX, IT IS TO BECOME THE CULTURAL SYMBOL OF THE NEW GLOBAL MOVEMENT! A SYMBOL OF SUBSTANCE, STYLE AND INTEGRITY IN A WORLD THAT IS TOO SUPERFICIAL. Before that he was Vice President of Brand Development, based in London, and responsible for the implementation of market strategies and interaction among markets for ABSOLUT VODKA, MALIBU, KAHLÙA, Wyborowa, Luksusowa and Frïs. Jonas Tåhlin started his career in 1998 as an assistant brand manager at Procter & Gamble. During his years at Procter & Gamble Jonas was stationed in Stockholm, Rio de Janeiro, Geneva and Caracas. He advanced within the company to Senior Brand Manager and finally Marketing Director for various brands within Procter & Gamble. Jonas joined Vin & Sprit as Zone Director Europe in April 2006. In 2008, after the acquisitionof Vin & Sprit by Pernod Ricard, Jonas became Regional Vice President of The Absolut Company in the Americas. During his 2,5 years as Regional Vice President of The Absolut Company in the Americas sales of ABSOLUT increased dramatically. In January 2010 he moved on to become Vice President, Marketing, Pernod Ricard USA for ABSOLUT before being given the task to create an entire new department at The Absolut Company. In July 2010 he led the organizational change when the new department Brand Development at The Absolut Company moved from Stockholm to London. Jonas Tåhlin holds a Master of Science in Business and Economics from Stockholm School of Economics. Jonas great interest in cars takes him to Nürnburg Ring in Germany where he test drives his personal favorites twice every year.